Holi is believed to be two days long festival and it is widely celebrated across the country as per their tradition or culture. It is to be noted that after Diwali, Holi is the second largest festival for Hindus and they do not leave any stone unturned to make this festival memorable. • Let this Holi be the best day you ever had. 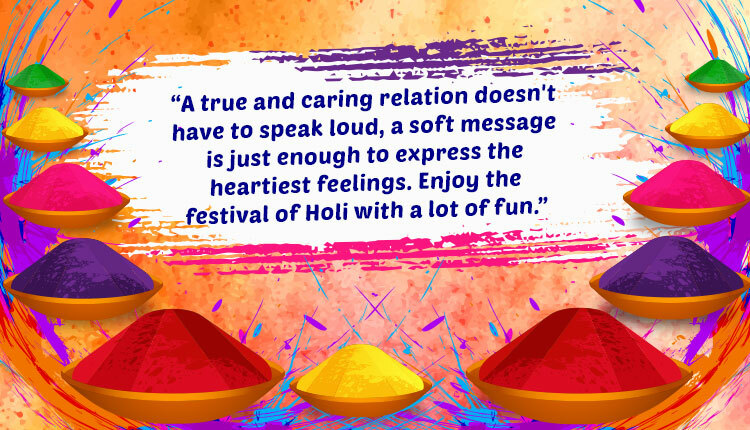 • Have a wonderful Holi. • We wish your health, prosperity and business achievements at this prism colour eve. May Allah bless you with all his mercies! Aamin. • This is the time to develop understanding and love for each other. Here, is a platform for you all to renew your friendship and to express the heartiest love by scribbling a beautiful Holi message for loved ones. 1. प्यार के रंगों से भरो पिचकारी, स्नेह के रंगों से रंग दो दुनिया सारी, ये रंग न जाने न कोई जात न बोली, सबको हो मुबारक ये हैप्पी होली!